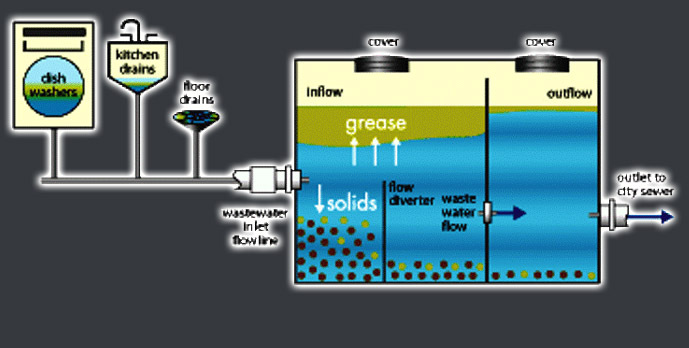 A grease trap prevents grease and food solids from entering the sanitary sewer system, where it can cause expensive clogs. It captures all of the waste deposited in the drain in the primary separation basin. Because the grease is lighter than water, it floats to the top and is “trapped.” The food solids, which are heavier than water, sink to the bottom. In order to be your total waste grease hauler, KGS pumps and cleans grease traps. At KGS we pump the entire trap, not just the grease floating on top, like some pumpers. We also use a deodorizer to eliminate any unwanted odors. Kostelac Grease Service will meet your restaurant grease trap needs.